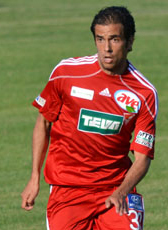 Adnan Alisic moved abroad in summer 2011. The midfielder was out of contract at Excelsior Rotterdam and signed a 3-year contract at Hungarian giants Debreceni until 2014. However, in June 2012 he already returned home signing a season contract at FC Dordrecht. In November 2012 he extended his contract for another two seasons until 2015. Alisic and the club were very satisfied. In July 2015 Alisic moved to Dutch amateur club GVVV from Veenendaal. The club competes at the highest amateur level, the Saturday Topklasse. He is currently playing on amateur level at Leonidas Rotterdam.